This feature highlights a number of meteor showers, comets and asteroids which are visible during the month of April 2011. Note: If anyone has pictures or observations of these objects/events and want to share them with my readers, send them to the Transient Sky at <transientsky1@yahoo.com>. Moon – The table below lists important lunar dates for the month, including the phases of the Moon and nights of lunar-planetary and lunar-stellar conjunctions. Saturn – This month Saturn is at opposition. As a result, the ringed planet is at its brightest for the year (magnitude +0.4) and is also visible all night long though it is best around midnight. At the start of the month Saturn may be too low in the SE at dusk to be easily seen but by month’s end it is far enough off the horizon at dusk to be easily seen. Saturn is a slow moving planet and takes 29 years to circle the Sun as well as 29 years to do one circuit around the ecliptic constellations. As has been the case all year long, Saturn is still located in Virgo about 11-13° from 1st magnitude Spica. Venus, Mercury, Mars and Jupiter – The long slow grind towards superior conjunction continues. This month Venus rises only an hour or so before the Sun and never gets very high in the ESE to E sky. Though Venus is a difficult sight for northern observers it is worth searching out at the end of April. During the last week of the month (and into May) Venus will be visited by 3 planets in the best planetary alignment of the year. Starting around the 25th, Mercury peaks above the eastern horizon 40 minutes before sunrise. Over the next few nights, Mars and Jupiter join the show. Use the crescent Moon on the 29th and 30th to point the way. Meteor activity is near a seasonal minimum in April. The year is usually split in 2 with January through June having low rates with few major showers while July through December have high rates with many major showers. Sporadic meteors are not part of any known meteor shower. They represent the background flux of meteors. Except for the few days per year when a major shower is active, most meteors that are observed are Sporadics. This is especially true for meteors observed during the evening. During April mornings, 10-12 or so Sporadic meteors can be observed per hour from a dark moonless sky. The Lyrids are usually good for 10-20 meteors per hour under a dark sky. This month the just past Full Moon will make the shower difficult to observe. So these remnants of Comet Thatcher will probably go unobserved except by automated video systems and only the most dedicated of visual observers. Additional information on these showers and other minor showers not included here can be found at the following sites: Wayne Hally’s and Mark Davis’s NAMN Notes, and the International Meteor Organization’s 2011 Meteor Shower Calendar. It seems the past couple of years have seen a bright Comet McNaught and this year is no different. 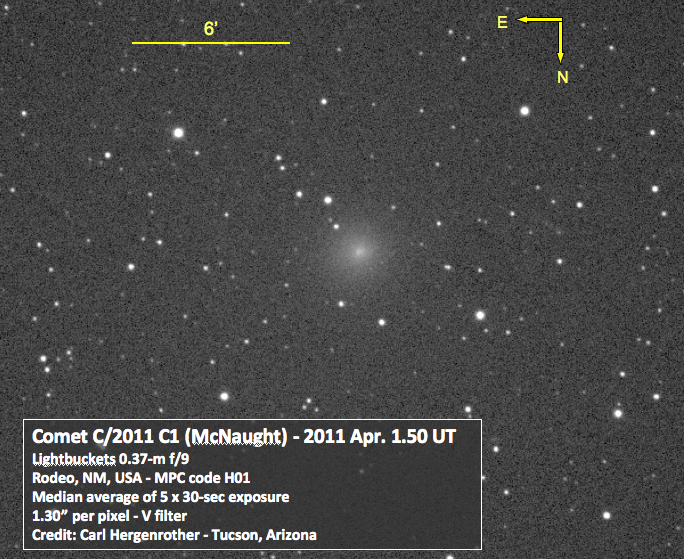 The 58th comet discovery by Rob McNaught and 74th from Siding Spring Observatory, C/2011 C1 was first seen on February 10th of this year. Though intrinsically faint, the comet is currently being reported as bright as magnitude 9.0. CCD images taken by the author on Apr 1 UT confirm that the comet is between magnitude 9.0 and 9.5 at this time (see image below). Unfortunately this will probably be as bright as the comet gets as it passes perihelion on April 17 at a distance of 0.88 AU from the Sun. It is also slowly moving away from Earth with a geocentric distance of 0.95, 1.06 and 1.22 AU from Earth at the star, middle and end of the month. Comet C/2011 C1 travels the length of Aquarius before ending the month near the Pisces/Pegasus border. Vesta is the brightest asteroid in the Main Belt. This is due to its high albedo (or reflectivity) which causes it to reflect ~42% of the light that strikes it. Vesta is also peculiar in that it appears to have evidence of volcanism on its surface. Similar to the Moon, Vesta may be covered with large expanses of frozen lava flows. It is classified as a V-type asteroid and is the only large asteroid with this classification. Many of the smaller V-type asteroids are chips of Vesta blasted off it by past asteroid and comet impacts. Vesta has dimensions of 347x336x275 miles or 578×560×458 km. The maps below were created from images taken with the Hubble Space Telescope. The geography is dominated by a large impact crater located near the south pole (the blue ‘donut’ in the elevation map). Perhaps this crater is the result of the impact that blasted off the smaller V-type asteroids. We’ll know more this summer when NASA’s Dawn spacecraft enters orbit around Vesta for a full year. Currently the encounter is scheduled for July 2011 to July 2012. Images and models of the shape of asteroid (4) Vesta. 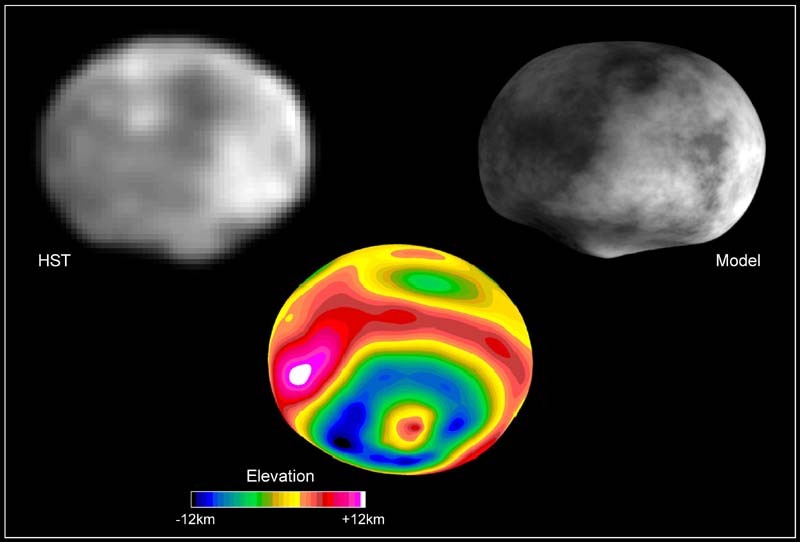 In the upper left is a real HST image, to the upper right is a model of Vesta’s shape, and on the bottom is an elevation map . Credit: NASA/STScI. Vesta spends the month around magnitude 7.6 to 7.3 as it moves eastwards through western Capricornus.